Amity is a mediator app which helps reduce conflict between separated parents for the benefit of the child. This app holds too vital functions to keep the peace; a shared calendar and messaging. The calendar can only be updated when both parties agree to the information being saved. The messaging side of the app picks up and volatile language used and gives suggested messages to send instead. To design an app which improves the lives of its target users by addressing a phenomenon we cant evade: Love in the digital age. Designing for finding love, maintaining love or after love. This was a four week project; the first two weeks were team research and the last two weeks was individual work. The research phase for this project was team based. Myself and two other classmates decided to look at after love in the digital age. We looked into difference areas of after love; after love self care, therapy, after love when kids are involved, etc. We did street interviews and created persons according to the information found. We then stepped back and looked at common themes between our personas and wrote ‘how might we’ statements. We had three personas to move forward with. Gary who didn’t see his relationship ending and has become a broken record to his friends about his recent separation and decided to isolate himself completely from his friend group after this. Roxanne who recently found out her boyfriend has been cheating on her for years and is devastated and isn’t ready to let the relationship end. Ellen a newly divorced parent trying to move on and start a new life but has to keep in contact with her volatile ex husband. I chose to design for Ellen moving forward with the project. I found there was more aspects in design for the two separated parents with the child in mind and wanted to look more into mediation apps and the thought of volatile language being removed from communication. I decided moving forward a co-creation session would allow for a lighthearted way to gain more information for this project as I would be asking single parents about their relationships with their ex partner. I got in contact with a single mother who told me her separation did not end well and was willing to be involved. I created an empty storyboard with different elements for my participant to use to help her story or to re-write her story. I also had the opportunity to hold the same co-creation elements with her daughter but I asked for how she would like her relationship with her dad to be like. This was very interesting as she (13 yrs) went straight to her online relationship. 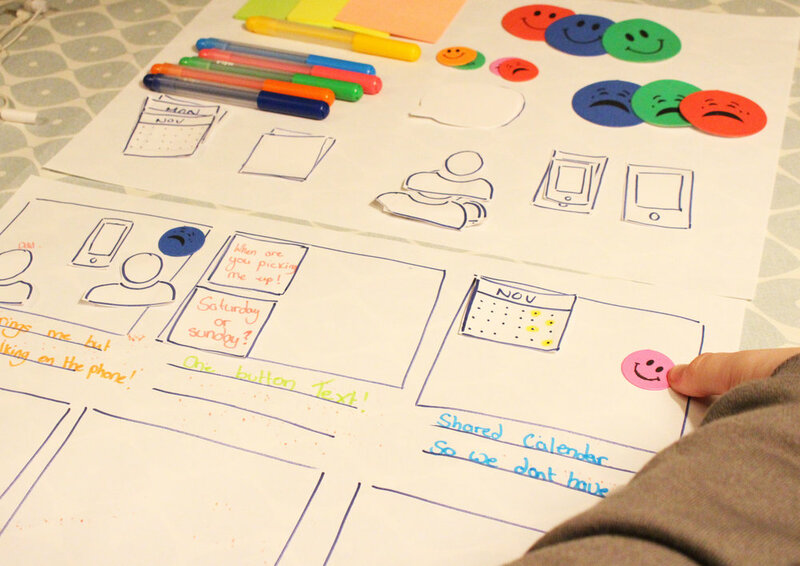 Sketching and paper prototypes helped to work out the main steps needed in the app for the goal to be met. This step was revisited through the processes and trying to simplify the app for the users benefit. It was also important for the app to not be a task and just a quick check. It also allowed quick iterations and some steps were taken out to speed up the use. This step helps in eliminating steps the user find irrelevant to the apps goal. 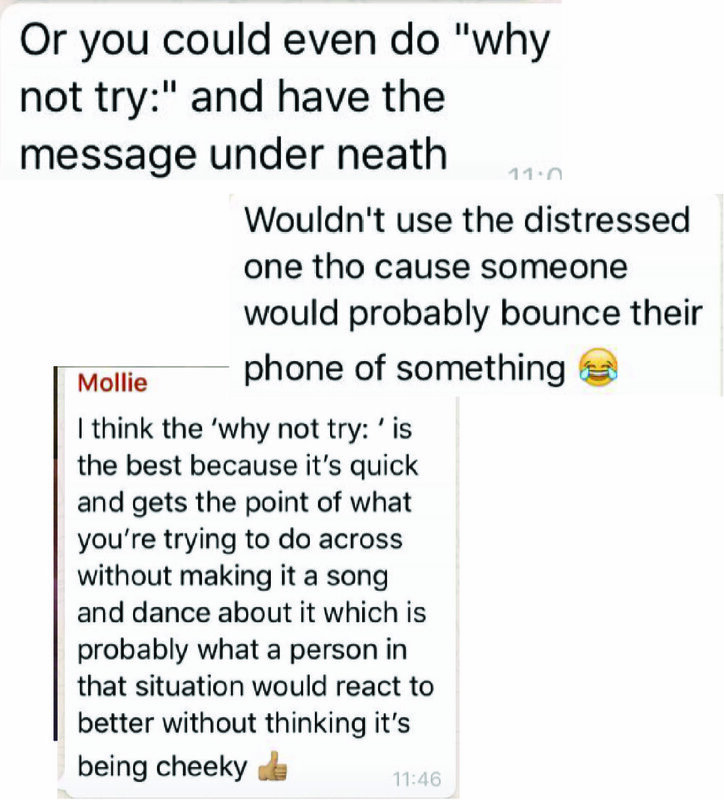 I also sent out a WhatsApp on different pop up language choices to see how people reacted to them. I then tested the user flow with a low-fi Xd prototype.